A young man with an older man’s revere for himself chooses his own name – a name worthy of the great kings of the past – knowing he is more than just a poor boy raised by his grandmother in a small cottage in a small village. From his humble upbringing he fancies himself ready for a new life. He pushes himself, studies, becomes world worthy, and then it is off on his great adventure to the King’s Grammar School and beyond. Educated, grown, and fulfilling his desires one by one, Edward Harry has become secretary to an esteemed clothier, rubbing shoulders with men of note, his unwavering self-belief and ego serving to bring him to the notice of even more notable men. A bit of flattery there, a spattering of clever wordplay here, and he is soon under new employment, sailing on a ship bound for Ireland and his new master’s home. Gone are London and the clothier, here are Ireland and a famous poet for a master, but Edward Harry has no inkling yet of the strange and magical welcome he will find on these new shores, and later in the land of the Sidhe. He will befriend enemies, learn the consequences of his actions, and above all else will continue to speak his mind, whether he be among servants, his betters, those vile and violent creatures he will encounter, or the awe-inspiring immortal beings of beauty and magic that will try to command him. Killingworth’s young protagonist has incredible wit and a delightfully endearing habit of referring to himself in the third person, both of which make for a particularly entertaining narrative. His superiority complex is at once both grating and brilliant, and adds to an expert portrayal of a difficult and complex character. This first book in the trilogy is set in 1591, and when the adventure begins back in Edward Harry’s little English village, with him as a young man deciding what his future should be, the reader is instantly impressed by his determination and conviction. Indeed it is the characterisation of the protagonist that is the main strength of this book, along with the vivid descriptive details that accompany him. The pace is languid, giving time to enjoy those wonderful descriptive elements and the nuances of Edward Harry’s personality, but the sense of urgency and danger that the story arc builds to are depleted as a result. 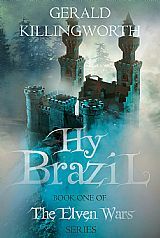 Hy Brazil has a traditional fantasy feel about it, both in style and content, and will appeal to those who enjoy immersive tales of the fae. This feels like the beginning of what will be a vast and meandering trilogy.